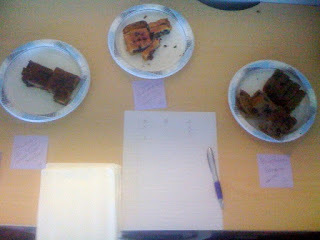 On my desk you will find 3 different kinds of vegan blueberry bread, along with a tally sheet. Please stop by and try one of each, then record your vote. Lastly, a blueberry banana bread. This is the actual e-mail that I sent out to a select group of my co-workers after lunch today, hoping that I could harness their afternoon sugar cravings into a focus group. As you know, I spent most of the weekend trying different blueberry bread recipes, hoping that I would be able to get a definitive answer today about which one was the best. Well, it was a useless idea, because we ended up with a 3 way tie. Personally, my favorite was the lemon blueberry bread, but I thought it was maybe just a tad too dense. I liked the banana bread as well, and it rose better than the lemon, but it was fat-free and a little dry. Perhaps I could have taken it out of the oven a few minutes earlier. I’m told that it was a three way tie because all of them were so good, but I think that it just goes to show that everyone has different tastes (except for one curmudgeon who does not even like blueberries). As such, I am going to take the dry ingredients from the banana bread recipe and mix them with the wet ingredients from the lemon recipe, and add lemon zest to the whole damn thing. I’m also going to try my new favorite flour, whole wheat pastry flour from the Whole Foods bulk section. I used it to make whole wheat naan last night, and it did not disappoint. During the two weeks that I was not a vegan, I had my friend Noelle order some Girl Scout cookies from our bosses’ daughter, who comes around the office every year and shakes us down is kind enough to sell us cookies. I absolutely love Girl Scout cookies. As a former Girl Scout myself, I think that it’s important to support the entrepreneurship and initiative of the girls who sell them. However, much to my dismay, Girl Scout cookies are not vegan. Some varieties are, but not the ones that I decided I needed to buy. I picked up my cookies this morning and promptly unwrapped all three boxes, deposited them on a desk, and let the vultures descend. I feel good about my decision. It was a major step for me, resisting the cookies that I used to eat by the boxful. I rewarded myself with peanut butter soy ice cream when I got home from work today, because we can’t all be perfect all of the time. It did get me thinking, however, that my next blog series might focus on reinventing Girl Scout cookies as vegan. Le sigh. I had every intention of making your blueberry lemon bread this weekend – now you have me torn over your original recipe and your new hybrid. I can only imagine your anxiety. Actually, could you just make all 3 and let me know which one is the best?